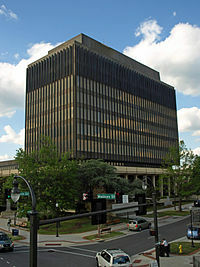 The Madison County courthouse, located in downtown Huntsville, is the location for the seven Circuit Judges and four District Judges of the 23rd Judicial Circuit. These judges serve the population of Madison County which consists of approximately 353,089 (2015) residents. In 2017, there were 12,270 cases filed in the Circuit Courts and 30,575 cases filed in the District Courts. The Circuit Courts disposed 12,732 ases and the District Courts disposed 29,700 cases.